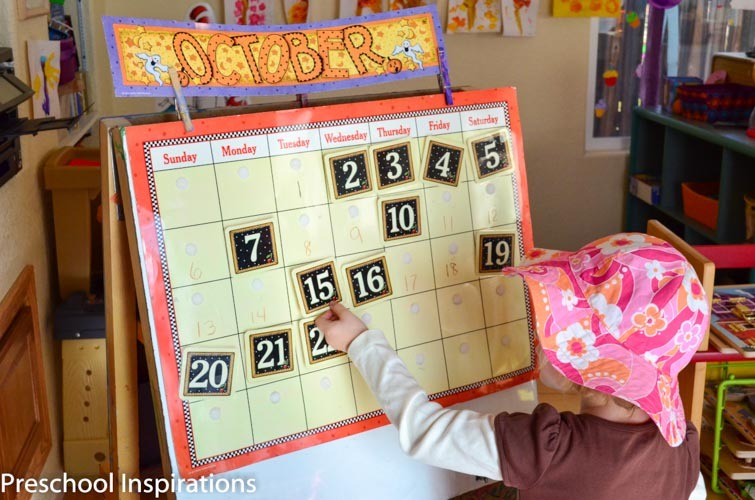 Calendar time is a daily part of many preschool programs and classrooms. But is calendar time truly necessary? I struggled with calendar time in my own classroom for years until I began to dig deeper and research it. I try to live each day with the philosophy “work smarter, not harder.” In the same way, I try to teach according to the same motto. 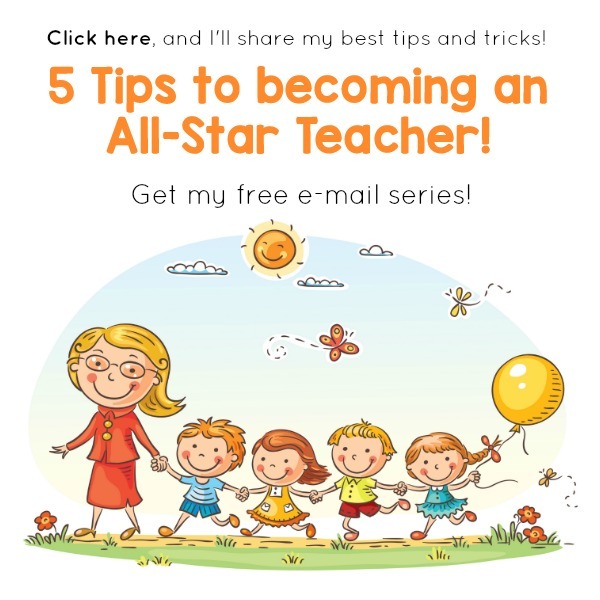 I have my preschoolers for a short time before they head off to kindergarten, and I want to make sure that I am making the most of each minute I have with them. Learning needs to be meaningful, and that means that I need to be constantly assessing my own approaches and methods. 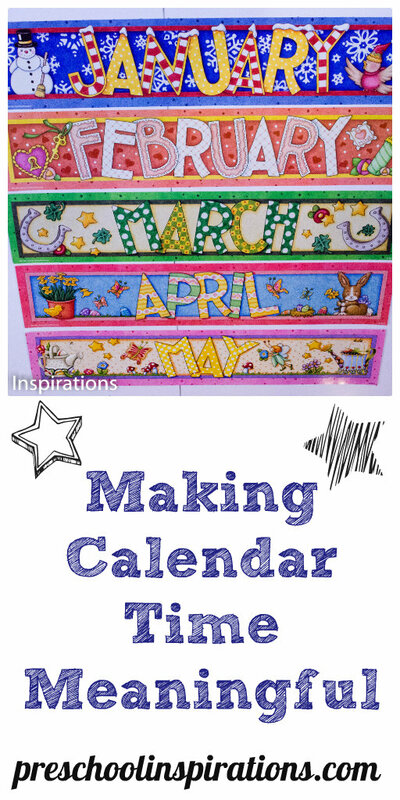 One of the activities that kept popping up on my radar is calendar time. I have worked at five different schools in my 17 years of working in ECE, and calendar looks different depending on what each school’s philosophy is. Well, maybe they would have been a little more understanding. Let’s just say no one dared ask for one in their classroom. I honestly felt completely conflicted within myself, feeling uncertain and confused with the two polar opposite extremes. But then I had a professor who gave me some perspective that I’ll never forget. One of my most dearly revered professors had me on the edge of my seat one class when she was talking about calendar time. I was hanging on to her every word. She told us that a four-year-old would have to do calendar hundreds of times (I am really wishing I had written down the exact number now) before they understood it. I am going to say it is 350 times (and I know that’s the ballpark). This means that it would take roughly a year and a half of doing calendar time for the concept to sink in. And that is if they go to school five days a week and the teacher does it every single day. We are talking years for kiddos who go less than Monday through Friday. This certainly does not mean that engaging in calendar activities is wrong or that it is damaging children. To me it meant that I was just wasting a lot of my time and their time. I would rather teach a child when they are ready or in a way that is exciting for them. Learning is a joyful experience where we come alongside a child’s interests and support them in that. Since I don’t think that learning should feel like pulling teeth, I took a step back and gave it some extra perspective. I would never try to have a five-month-old who is just sitting up try to learn to walk. I would support them where they are at and keep encouraging their development until the time was right for them. So why was I dragging these concepts through circle time when they would just “click” one day? I’m not the only one questioning this practice though. 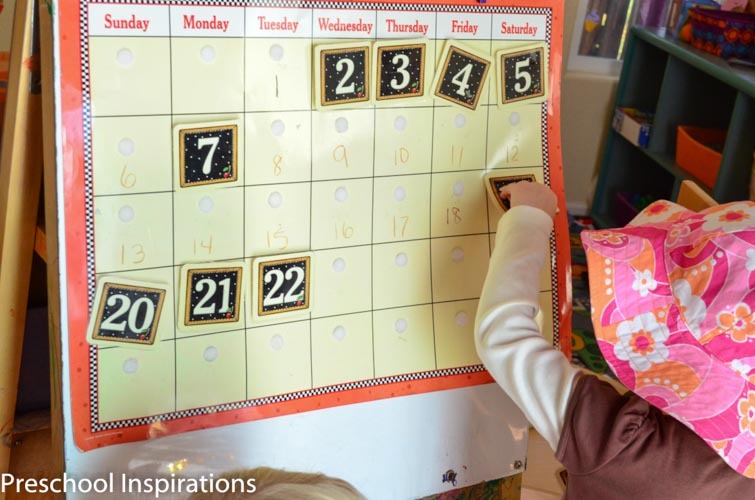 There is a really great article written about this “calendar hot topic” from the National Association for the Education of Young Children called Calendar Time for Young Children: Good Intentions Gone Awry. According to this article, it all comes down to the fact that calendar time for preschoolers and even kindergarteners is not meaningful. Young children can understand the concepts of before and after, but not the days of the week. Be careful not to mistaken this with rote memorization. In fact, according to the author, Lilian Katz, the ability to understand how many days there are from now until a future event will not take place until a child is between the ages of 7 and 10. Instead, children gain value from visual schedules. If you are like me, you may wonder about children who are very advanced. Would this be appropriate for them? I certainly wanted to find the answer to this, so one year I did my own case study. I began teaching calendar time to my most advanced pre-kindergartener. If anyone would figure it out, it would be her! “What is today”? “Which day was yesterday”? “What is tomorrow”? “How many days until _______”? We went over them four times a week, and after two steady months, my question had been answered. For a child who mastered skills so easily, I could see that this activity was still too advanced for her. How do we make calendar time developmentally appropriate? I had come to a crossroads. Do I just throw out the whole concept? Do we do it on occasion? Can I adjust this to make it meaningful? Thankfully, I decided I really wanted to devise a way that could work out for everyone. I desired to provide a solution for those teachers who just love calendar time, and I was determined to make it developmentally appropriate for preschoolers (and kindergarteners). Actually, since this was originally published, many people have commented below with great ideas about how they make calendar time engaging. And I compiled a bunch of ideas that are developmentally appropriate ways to modify calendar time. But I’m just about to share the “aha” moment I had with doing calendar time and transforming it to an engaging part of our preschool day. I decided that I wanted to try out something new. Do you ever feel like calendar time takes up so much of circle time? After days of the week, months of the year, counting to 20+, talking about patterns, doing daily helpers, saying the Pledge of Allegiance, having a welcome song, reading a book, and talking about a concept, circle time can be way too long. OK, so I know not everyone does all of those things, but maybe you do or know someone who does. And then the children can’t sit still. And then you feel like you’re addressing behavior instead of what you really want to talk about for circle time. I would rather spend circle time building community and having meaningful discussions. Circle time is meant to be about forming relationships, building trust, engaging one another, and telling stories. But I felt that had all become an afterthought. So this is how I completely transformed calendar time. I decided that instead of using it in a large group setting, we would have it during center time on one side of my easel. Children can come and go as they please and spend as long as they want. They can touch it, rearrange it, and just explore it! Wait??? Did I just say that I let my class have full rein of the calendar? My interactive calendar mostly focuses on math, and I don’t even bring up the days of the week. Well, I do in other meaningful ways, such as with songs from Music With Nancy, but I don’t do it with the interactive calendar. Let’s be honest, children can learn those days of the week songs in a flash. The main focus of this calendar time is to familiarize preschoolers with how a calendar looks and to give them more confidence with numbers. But most of all? My students got a way to enjoy and engage in matching, sorting, patterning, number recognition, etc. To make it sturdy enough for little fingers, I laminated all the numbers and added velcro dots. The soft side to the calendar and the scratchy side on the numbers. But let’s be honest, that doesn’t really matter. Centering them correctly does though. Let’s just say I learned that one the hard way, ha. Each day I write the number that we are on with a dry erase crayon. The dry erase markers rub off too easily, so the crayons are perfect. Then I put the numbers in a container for them to find at the bottom of the easel. You may even see child written numbers on our calendar from time to time. 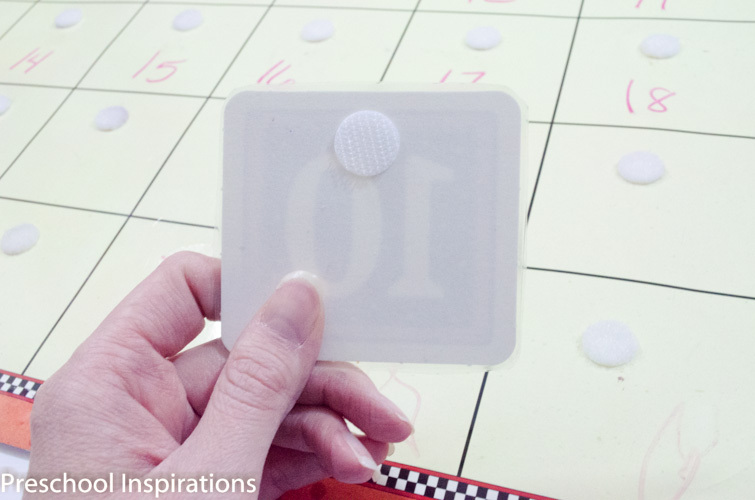 They love to match the laminated number cards with the handwritten numbers! Calendar time is so much more meaningful now! Sometimes, just one child will play at the calendar center, but lots of times, I find two friends there helping one another. Within a few minutes, I usually see a completed calendar after some great teamwork. This has truly been an incredibly successful approach to calendar time activities. I have found my preschooler’s comprehension of numbers and quantity has skyrocketed. 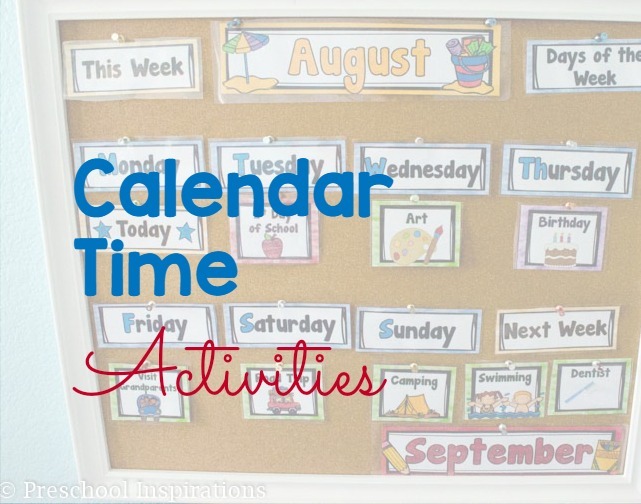 Calendar time is not a task to do anymore — it is an interactive experience led by the interest of each child. We don’t even do this every month, just as long as they find it fulfilling and interesting. And to be honest, calendar time has never been better! It’s a pleasure to have you, Becky! Thank you so much for the inspiring comment. If you try the interactive calendar (or your own improvised version), I’d love to hear how it goes. I have been teaching Pre-K for 18 years and I have always used a calendar as part of Circle time. It has never really been about the months or the days. It has always been used as a math activity. Number recognition, counting, what number comes next, patterns which are on the calendar pieces that the children match to the dates on the calendar. I think we can take almost anything and make it appropriate for and relevant to our children. Great article! I love how this interactive calendar doesn’t focus on days. How creative! Why thank you, Jill. I appreciate you hosting the Thoughtful Spot Weekly Blog Hop! There are so many great ideas there! When I started homeschooling my oldest child as a preschooler I tortured us both with calendar time – month, date, weather outside, holidays. PURE TORTURE. His K/1st grade math even had it as part of the curriculum. About 6 months into it I threw it out. Now that my kids are 5, 7, 8, 10 years and another that’s 8 months I can attest to kids not grasping the calendar concept until 7-10 years. They may parrot back the right answers but they don’t really understand what you are talking about. With my 1st child I tried to do it all the “right” way (according to my education background and loads of books). I never did any preschool type stuff with my 4th child and amazingly enough he’s learned it all anyway. Thanks for reminding me why we don’t do calendar work. 🙂 Thanks for linking to Family Fun Friday. Thank you so much for sharing your wealth of experience with us, Stephanie Kay! I do agree about the torture aspect :). It is amazing how children just learn so easily, and it’s when we stress about advanced topics and try to force them, that it just adds more work and frustration. Learning is meant to be natural…not stressful. I have been teaching preschool for almost 2 years. Up until now I have trying to make calendar work not wanting to admit that it’s not. 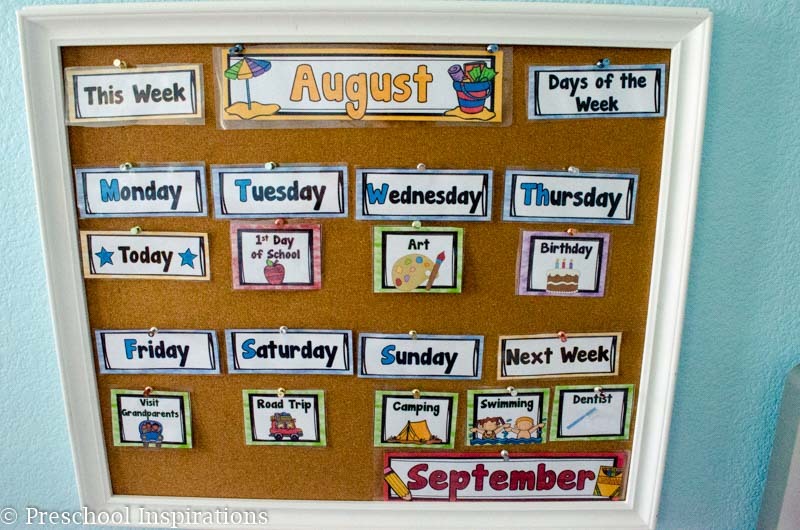 I love your idea for using the calendar as almost a center, my kids already love mess with it so this will be an easy transition. What is your view on talking about the weather or should that go away to? Thanks for visiting, Candace! I hope your class loves getting to interact with the calendar soon. I wish I had thought of this when I was only two years into it :). As far as weather, I would gauge the interests of your class, but I think that there are some great science lessons that are age appropriate. Does your class enjoy talking about how it feels outside and what the sky looks like? I feel that weather does not have to be taught in circle time necessarily. It can be interactive as well by bringing in a sensory table full of snow or rain. You could use a fan to demonstrate wind or a hair dryer to blow warm air on them. And I have some weather ideas in the works that will be coming out in a couple of months. Happy teaching! Thank you for the wonderful and insightful comment, Mary Catherine!! I think you bring up a good point which is that teaching is all about balance. As long as we are using children’s interests and involvement as a guide, we will continue to provide meaningful activities. We can use anything in the classroom as a tool, and awesome teachers like you provide environments that are child-centered and help easily bring out the innate abilities and skills of the children. Wow! I found this post really interesting and it leaves me in a stupor of thought. I have read articles like the one you site about calendar and time not being an age appropriate skill for preschoolers, However I have a recently turned five year old boy who knows the days of the week, can tell you what yesterday was or tomorrow will be, and also site significant things that happen on those days. For example, my son can tell you that today is Tuesday, which means that tomorrow is Wednesday and we have preschool, and that in four days is Saturday and Dad doesn’t go to work. All that being said, I don’t focus at all on yesterday, today, and tomorrow during calendar time. We focus on the months and seasons/holidays that accompany each month. We mark important dates on the calendar, such as birthdays and holidays, and use the calendar as a way to organize the passing of time to reach those events. Last year I used calendar time as a way to reinforce patterns, but this year I will be doing something different. As I give your post more thought, you may find that I will write up my own using you as an inspiration! I think you bring up such an important factor, Sarah. 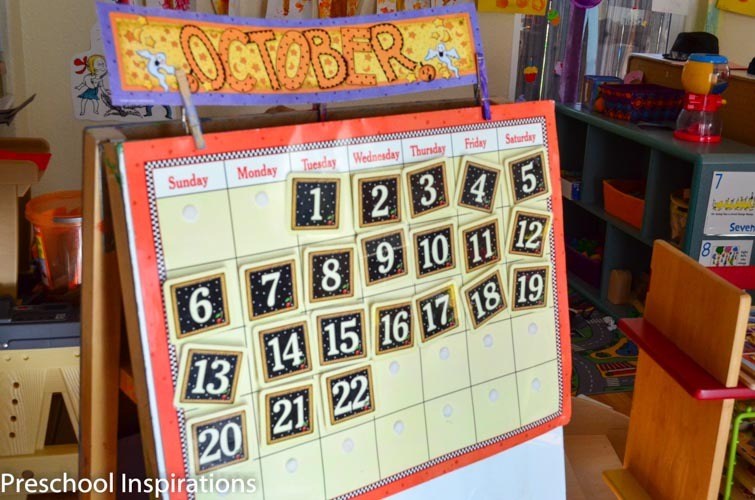 You have set the stage for meaningful learning by personalizing calendar time with important events that are helping your son conceptualize the concept of time. He is hugely benefiting by having you bring those days to life for him. I’ve definitely seen lots of five-year-old students with emergent skills in this area, and my own daughter knows many concepts too, despite the fact that we don’t do calendar time. I can’t wait to see what you come up with :). I love calendar time but I think it totally depends on your approach. There is so much meaningful math that can be taught on a developmentally appropriate and more concrete (less abstract) ways like you did here so the time is reaching every child! Hi! 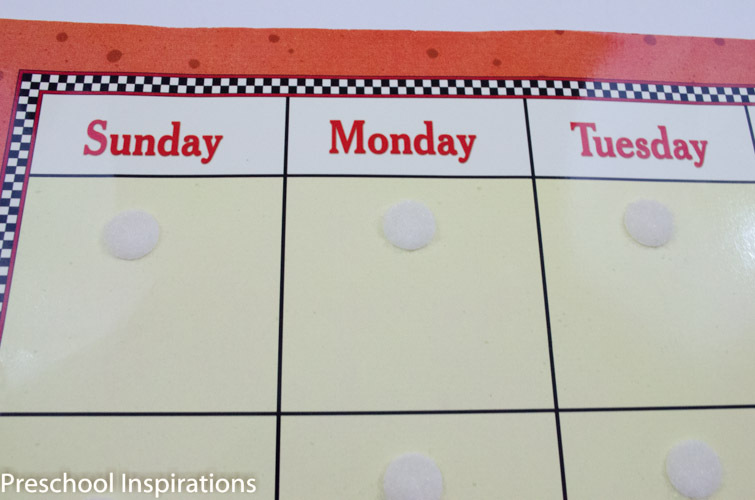 I loved this post, but also have a technique I have used that is still incorporated as a group calendar activity. I cut out rectangles of construction paper in each color of the rainbow. Approximately 4 by 6 inches for mon-fri (red-blue) and then skinnier purple ones for sat and sun on each end. I put them together in a line and laminated them. I did write the day of the week small at the top. We had a star called today and we moved it onto the color each day. The preschoolers learned the concept of the motion of a calendar going left to right. If we had something special one day I would put a little marker there. For example if it is Monday (red day) and they have a special party on wed (yellow day) we can still count up to it and show progression of time without having a large number to count to!! What a beautiful way to incorporate that in your class, Lauren! I am especially fond of using color differentiation, so I think it is a brilliant idea! It is a pleasure to have you visit, and thank you for all you do for young children! Oooooh…this is a GREAT post!! Thanks for this! Thank you so much, Stephanie!! It’s always a pleasure to have you visit and comment! Thank you! I am just starting a homeschool preschool journey with my daughter and our circle time/morning time is just not taking off the way I was hoping. This gives me the courage to really make amends and let her lead the way with this! Thank you! I am so excited for you, Rhiana! Learning can be so engaging and exciting, and I can tell your homeschool journey is going to be a wonderful one :). i have been looking for a meaningful way to do calendar in my class- but have been doing it for so long it’s hard to change! But I am definitely willing- and I like this idea a lot! Now I just need to revamp our morning meeting! Any ideas? Change is hard, Dawn! It can be great at the same time though! What are the ages that you teach? I recently started teaching 2 yr olds, in my classroom is a calender . I tried it for a week and then asked myself what am i doing? I stopped doing the calendar but always do some type of counting activity. Love this article. Thank you so much, Mary. I love how you are evaluating the needs of your class! You sound like a wonderful teacher :). I work with children with additional needs and if something interrupts our day and we miss calendar and weather time my class do remind me. We use interactive whiteboard where I have built in links to the Web pages for ‘Starfall’ calendar and BBC weather site. The independent use of IT links has benefited us all and memory skills develop as we mark class and family birthdays, special school events which will come up each month and revisit day by day in a particular month.. The maths we talk about surprises me! And when colleagues watch the children engage in this activity they say they are amazing and could teach their older main class children a lot. No comparison to past velcro attached days of the week etc! What a wonderful opportunity you and your class have to use that technology, Sarah! I love your focus on meaningful days and events. I’ve never used an interactive whiteboard, but I’d love to get my hands on one some day. Thanks for visiting! I really love this idea! I also love the calendar headings. How/where did you get those? I am so glad to hear that, Mary Kathryn :). My calendar set is a Mary Engelbreit one from a teacher supply store. Reading this a year after you posted it looks like. I am required to do a group calendar, but it’s very interactive. My only goal is for them to see the relevancy of numbers and to simply see both numbers and letters in use. I also use it for vocabulary. I find that kids are curious about what adults do and like to participate in our “adult” activities.They love to guess the “answers”. Still debating the use of electronic calendars which is what most of their parents use. I have shown them my electronic calendars and how they work but that’s as far as I have gone with that. What I have not done, is use it as a center like you have. I love the idea. Where I teach, no one is required to perform in any way or even participate, but they almost always gather when I sit there. Thanks for the extension into a center idea. I am excited. I love hearing about how you engage your class, Kati! You sound like such a fantastic teacher, and I hope your class enjoys my version. It’s such a pleasure to have you comment! You have probably read this already in one form or another, but I am applauding you in my little corner of the South! This is my favorite version of the calendar that I have seen! I am all about meaningful play, and this version is truly it! Thank you for sharing! That means so much to me, Heather! Thank you so much for taking the time to let me know :). Thank you for your ideas of placing the calendar in an interactive way. What things do you do during the time you previously did calendar? I love this idea! I too stopped the traditional calendar time and turned it into more of a math centered calendar time that was more meaningful to the students. I chose to do calendar at the end of the day or before the students go home. We chose a pattern for our calendar. Most of the time I use sticky note or cut out paper shapes. Whoever is the calender helper gets to draw a picture of their favorite things they did at school that day. They tell me what it is and I dictate a sentence onto the sticky note, I make sure they write their name and the number day on the note. I will assist those who cannot write their names or my aide will assist. We will then count the number of days till a field trip or birthday because those are things that are meaningful to preschoolers. We sky-write the numbers and I touch on the day and month but never make them remember or repeat them, It has become one of their favorite times of the day and if we don’t get time to do it, they always let me know! This is beautiful, Michelle!! What a perfect way to make the day meaningful to your students!! You sound like an incredible teacher :). I do a seasons calendar, I put the name of the season eg autumn in the middle of a large piece of card and around this I put pictures for each month in that season, eg September is pictures related to going to school, October has harvest and Halloween pictures and November has guy fawkes. Then I have pictures of typical autumn weather.the children love it and because it is bright autumnal colours all the children from 1-10 yrs like looking at it and talking about it. What a great modification with elements that are relevant and meaningful to the children! Thank you for all you do for young children, Debbie! I have a home daycare and mainly ages 2-4 sit for circle/group time. I have a calendar. What should we focus on for this age group would you say?? Great question, Jodi! I have an entire post on this actually :). Here are my favorite ways to engage young children in a large group setting: Circle Time 101. Hi and thank you for your posting. I have worked in a pre-K classroom for 12 years and I have always struggled with “teaching” the calendar. Every year, there have been one or two children who ” get” the calendar, but I think they arrived in our classroom with that knowledge. They can look at the calendar and tell you how many days until the weekend, and have a sense of the difference between days/months/seasons. They also understand the concept of the year and when their birthday is, as well as the birthdays of family members. However, most of the children don’t get it, and this year I don’t seem to have any children who are more advanced in their calendar knowledge. 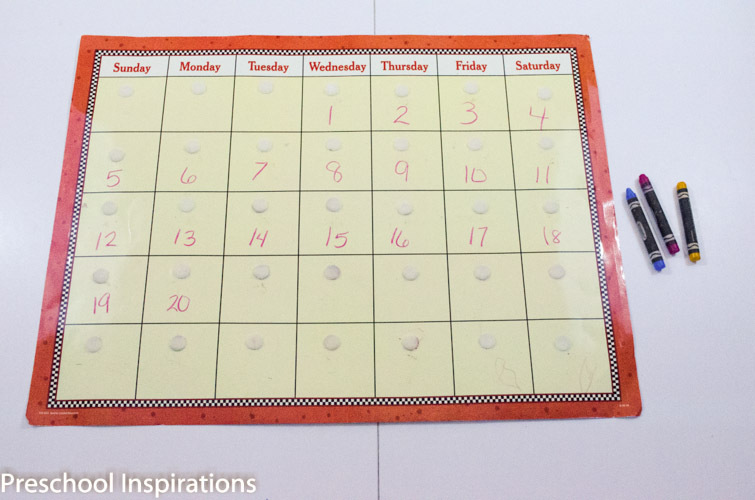 I use the calendar more as a visual tool for patterns and counting and we sing a “days of the week” song. They get a kick out of guessing which piece of the pattern is next, and they like to count the days. But, I think they are not really grasping the larger picture of days, months, seasons and year. I do wish our program wouldn’t emphasize the use of the calendar and I have, at least, managed to eliminate it as a daily activity. I’m gratified to learn that many of you see the same level of understanding (or NOT understanding) among your own preschoolers! I use the calendar to teach patterning, no so much about the numbers. Each month we have a different pattern, starting with an A-B pattern. Owl-leaf was in September. As the months progress the patterns become more intricate. The children love guessing what pattern will be next.